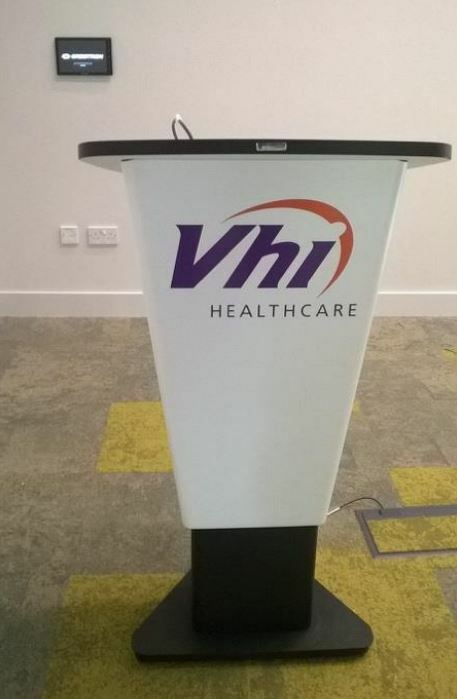 VHI is the largest Health Insurance Company in Ireland. 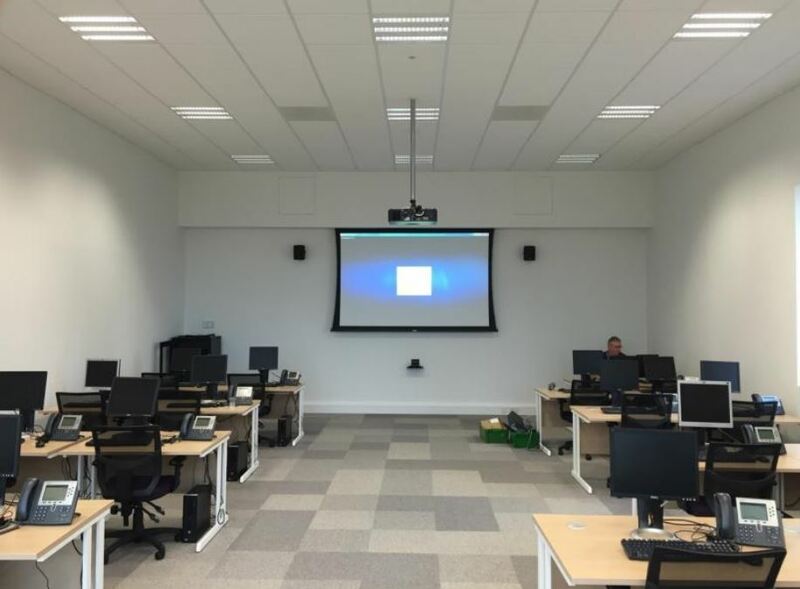 In 2016, a plan for a large expansion of their training and call centre located in Kilkenny was drawn up, and a large audio visual fit-out was one of the main focal points of the project. 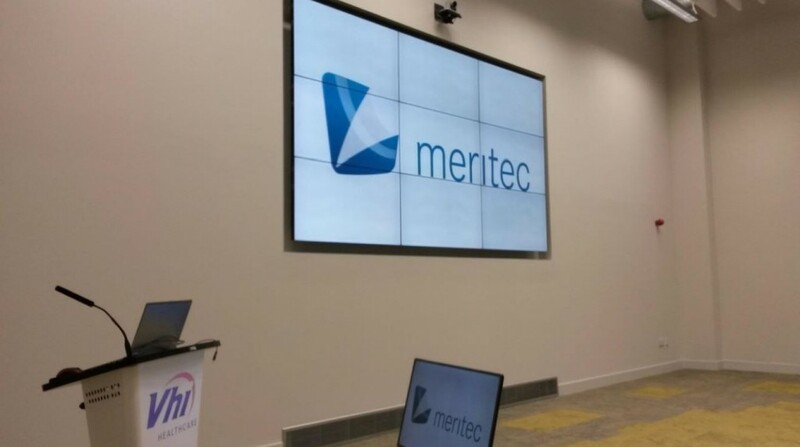 Following some consulting and various system designs, a proposal was created and Meritec were successfully appointed by VHI directly to complete this substantial Audio Visual fit out worth circa €300,000. This town hall was the main focus of the project from the beginning. VHI wanted a high impact, high spec display at the center of this spacious town hall area. This would be used during important executive briefings, Executive Video conferencing calls, training seminars, and to create an exceptionally professional environment during important client visits and meetings. After some consultation, it was advised by Meritec to opt for a 3×3, 55” Panasonic ultra narrow bezel, high brightness video wall so to meet the client’s requirements and expectations. 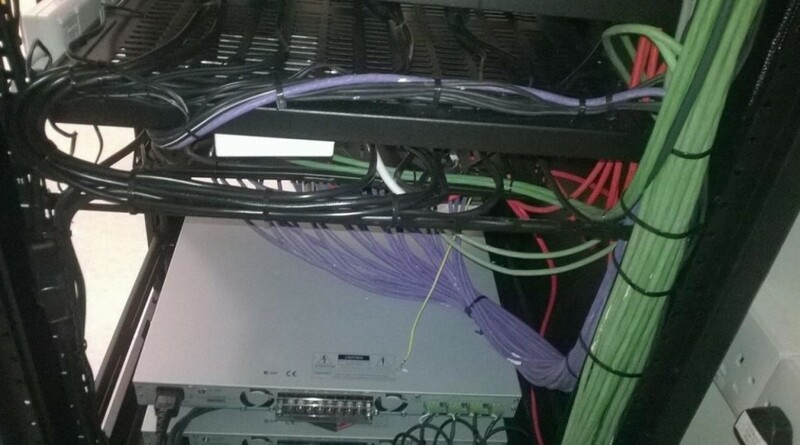 This room also incorporated a room divide and support monitors and also a full Video Conferencing Solution. Polycom Group 700, Dual Camera Video conferencing system Poylcom Group 700, Dual Camera, video conferencing system delivers an exceptional video conferencing experience in this room. One camera is setup to capture the presenter, and the second camera is installed above the Video wall to capture the audience during a conferencing call. 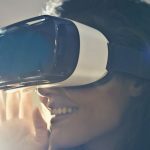 This high spec and truly flexible, Video conferencing system has the capacity to also share the presentation material during the call so both parties can communicate on the topic adding to the naturally immersive feel of the VC call. NB: In this photo, you can see the strength of the zoom on these 12x cameras zooming in on the photographer at the back of the room. Also, notice the support displays showing the same image as the Video Wall. 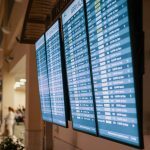 These support displays can also show separate content to the Video wall due to the powerful Crestron Switching, signal management and control system at the center of this flexible and easy to use solution. Support displays that could be switched to independent presentation displays when the room dividing wall is closed over. A secondary input position at one of the support displays to provide an independent input position for laptops when the room is split/divided. Crestron Touchpanel control system – Very simple to use and sleek design. Programmed and setup by Meritec’s exceptional in-house programmers. One of the main aspects of this room that highlights Meritec’s design and engineering expertise is the delivery of a successful and flexible room divide (or split) which was a main request of the client. 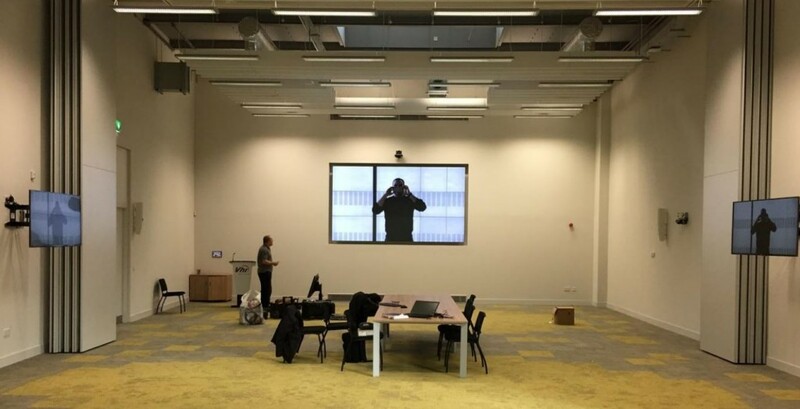 The client needed to have one large room/town hall space that could sit 100 people one minute, then be completely transformed into two separate individual presentation rooms the next. 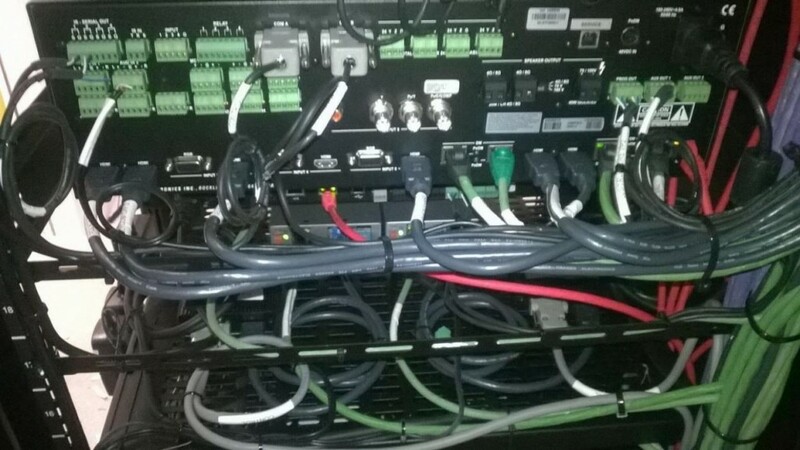 These photos taken from the dedicated, air conditioned, Audio Visual Rack room show the exceptional skill, expertise, and incredible attention to detail that the Meritec Engineers pride themselves on in each, and every, project and installation. This is one of the main reasons why Mechanical & Electrical consultants, Building contractors, Electricial contractors, interior designers and architects want to work, and prefer to work with Meritec. That, and the fact that this Audio Visual project was delivered on time and on budget. Each and every cable is labelled and numbered making it exceptionally efficient when carrying our maintenance checks as part of our Service Level agreements (SLA’s). 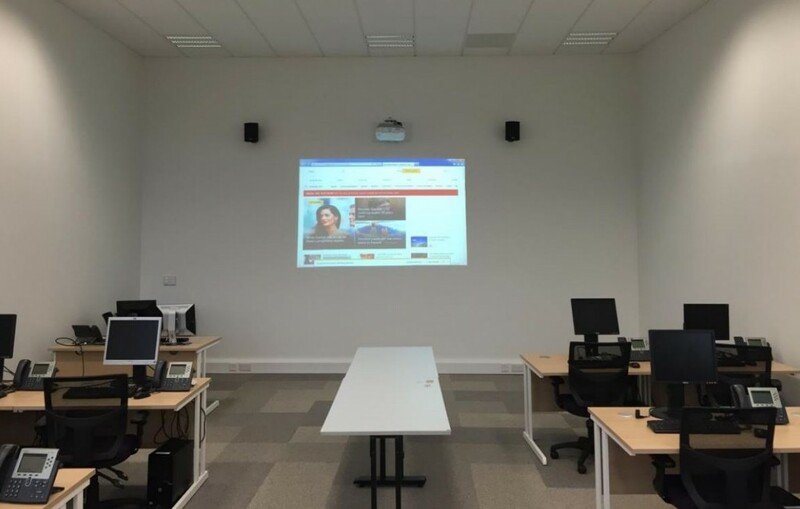 As part of our proposal, we had to design and install AV systems into 4 large training rooms. As per the client request, we were asked to de-install equipment from 2 training rooms, from a separate part of the building, and design the new systems with this existing equipment in mind. 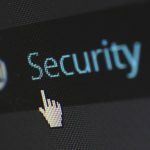 This requires extensive planning and project management in order to ensure that the existing equipment will be compatible and work with the new equipment. Other Rooms This training room has an EPSON Ultra Short Throw Projector mounted to the wall. 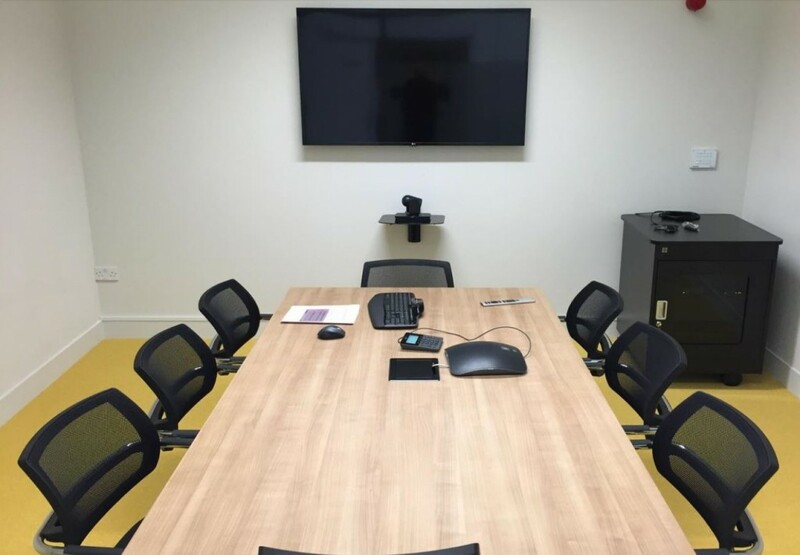 These 4 meeting rooms are great examples of clean, neat, yet very effective and powerful working spaces where users have the capability of presenting from their laptops via a wired HDMI or VGA connection or Wirelessly via Barco Clickshare (USB Wireless transmission system) or switching instantaneously to a high standard Video or audio Conferencing call.